Israeli soldiers invaded, on Thursday at dawn, several areas in the southern West Bank governorate of Hebron, and Jenin governorate, in northern West Bank, searched many homes and workshops, and abducted six Palestinians. The Hebron office of the Palestinian Prisoners’ Society (PPS) said the soldiers invaded many neighborhoods in the city, searched and ransacked homes, and abducted a child, identified as Yousef Mustafa Hajahja, 14 years of age, from the Old City. 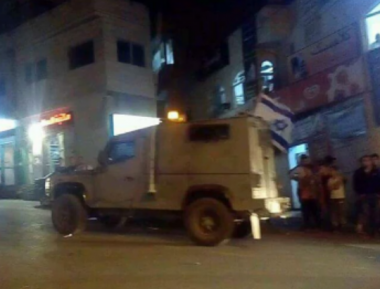 The soldiers also invaded homes in Ethna town, west of Hebron, and abducted Sami Ja’bari and Ahmad Abdul-Rasool. Another Palestinian, identified as Ibrahim al-Husseini, was abducted from his home in the al-Fawwar refugee camp, south of Hebron, while the soldiers also illegally confiscated mobile phones and computers from his home. In addition, the soldiers invaded Yatta town, south of Hebron, also searched homes, before abducting Saddam Majed Zein, 33, and Abdul-Karim Nayef Zein, 28. The Israeli army said its soldiers managed to locate weapons and combat materials, during searches in Yatta and Bani Neim towns, and in Hebron city. The army claimed locating a lathe machine, used for manufacturing homemade weapons, and ammunition, in Doura town, north of Hebron, in addition to locating M1 rifle, in Bani Neim town east of Hebron. The soldiers also said they located two instruction manuals, used to manufacture M16 rifles. In related news, the soldiers invaded Qabatia town, south of Jenin, searched homes, and a blacksmith’s workshop, and abducted a young man, identified as Homam Adnan ar-Raja.